Many homeowners when faced with an attic ventilation project, decide that it is too difficult to obtain AC power in the attic in order to operate an attic vent fan. The importance of having a well ventilated attic should never be under estimated. When using your air conditioning system a ventilated attic will keep your home cooler without running your air conditioning as often. That equates to lower electrical bills! Proper attic ventilation also reduces humidity in the attic, especially in winter months, which can lead to condensation, which in turn will enhance the growth of mold and mildew and create rot. 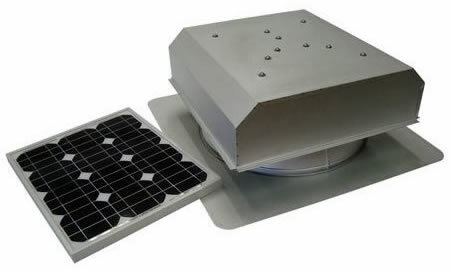 To help homeowners who are not prepared for the expense of adding power to their attic in order to provide proper ventilation, manufacturers have created a range of solar powered attic ventilation fans. How a solar powered vent fan works. Basically the solar vent fan is comprised of two units. A fan and motor mounted in a weatherproof housing, as shown in Figure 1. A solar cell array which provides the power for the motor, as shown in Figure 2. The fan and motor in its housing is mounted near the ridge of the roof in the same manner as any attic vent fan. The solar cell array is generally mounted on top of the vent fan although in many cases the solar cell array can be mounted separately from the fan in order to place it in a position that gets more direct sunlight throughout the day. For roofs that are gable design, as shown in Figure 3, it is most common for the solar cell array to be mounted separately from the fan and motor housing. When sunlight lands on the solar cell array it generates electricity which in turn powers the fan. The only preventative maintenance which should be performed is to clean the solar cell unit, as dirt, grime, leaves and other debris will reduce the solar cell array’s ability to generate power. 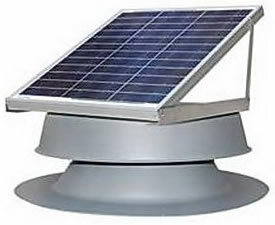 Selection of solar powered attic vent fans . Of course the biggest advantage to solar powered vent fans is that they do not have to be wired to the home’s AC power, there are no wires that have to be fished through walls and ceilings, and no switches or thermostats to install and fiddle with. Because there is no connection to AC power, the homeowner does not have to be concerned about following any electrical codes. The fan will operate whenever direct sunlight is on the solar cells without any intervention. 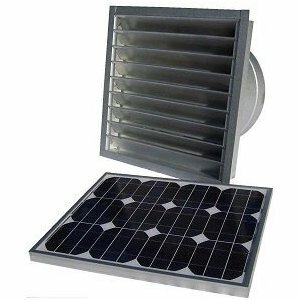 There is no operational cost of a solar powered attic vent fan as the sun’s energy is free. The biggest disadvantage to solar powered attic fans is that they require direct sun light in order to operate. That means that the fan will most likely not function when the sky is overcast or during rain, and of course it will not operate at night. If your attic is well insulated and snow remains on the roof, it is possible that snow could cover the solar cell array making it inoperative. Secondarily, there is no way to turn the solar powered attic vent fan off if for some reason you do not want it to operate, although that might be an unusual situation. The solar cell array can be damaged by severe weather such as hurricanes and tornadoes. As good attic ventilation is equally important in the summer and winter it is important that the positioning of the solar cell array takes into account the year round position of the sun. It is possible to inadvertently install the solar cell array in an excellent position for summer sun, which turns out to be a poor position for winter sun or vice versa.